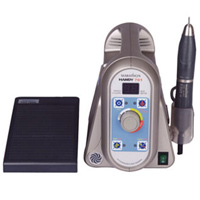 Dental laboratory handpieces mikromotor are one of the most used equipment in a dental lab; so choosing the best one for your practice should be carefully considered. There is a large number of dental laboratory handpieces and their corresponding motors on the market. Features vary from handpiece to handpiece but can include; all-in-one turbine, air nozzle and spray, reduced weight and ergonomic design, whisper quiet/ no vibration, high torque, fiberoptics and smooth transitioning while increasing or decreasing rpm’s. When choosing a dental laboratory handpiece and motor, consider what features that will be most beneficial to your dental lab as well as what materials your lab works with most frequently.